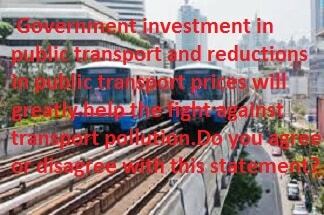 Government investment in public transport and reductions in public transport prices will greatly help the fight against transport pollution.Do you agree or disagree with this statement? I agree with this statement very much as this is an issue that I feel strongly about. I feel very much that we should reduce the amount of fossil fuels that we use and I believe that investment by governments in public transport will help reduce the increase in transport pollution. At rush hour every city in the world experiences huge congestion on their roads. This is because nearly everyone who can afford a car owns one and uses it whenever they can. Very often cars which can fit five people in them only have one occupant. Just imagine the amountof unnecessary pollution! Now a bus with fifty seats could carry drivers of fifty cars. Pollution would be hugely reduced. To force more people into using public transport, governments could increase private fuel prices and car taxes. Some people say that buses are not reliable enough, that there are not enough of them and that the prices have become too high. However, if the government invests more so that there are many more buses and trains, all at cheaper prices, then more people would use them and so the money taken would pay for the extra buses and employees. Governments could in turn reduce fuel prices for public transport so that prices could be lowered more easily. Of course it would be even better if we could get everyone to use transport that didn‛t use fossil fuels at all. Denmark and Holland are famous for having lots of people who travel to work and back by bicycle. Maybe this will happen more in the future. Is my view realistic or am I just a dreamer? I feel that it‛s just a dream. People prefer their own cars and don‛t like buses. I still feel though that governments should try.